The adventure begins! The names Samarkhand and Bukhara have always sounded magical to me, and I am finally off to explore a new part of the world! On August 26th, after a week with family in England, I boarded a direct flight to Tashkent on Uzbekistan Airways. I was due to meet my fellow travelers on August 30th. Heading off for three days alone in a very distant city where I speak no common language was a little daunting, but exciting. As it turns out, as with most travel worries, my fears were unfounded. The weather on arrival was warm and sunny, and I was met by helpful English-speaking taxi drivers who organized me and got me to my charming small B+B close to the main bazaar. Tashkent is big and beautiful, with wide avenues, lovely architecture, and many parks and big trees. The climate can be very hot in summer and very cold in winter, but Spring (April and May) and Fall (September and October) are the months to be here. Lucky me! By August 27, I was settled in to a very comfortable single room at Hostal Gulnara. I quickly got to know some of my fellow travelers, and was amazed by so many adventurous single people going all over Asia alone on extended trips. I right away became good friends with Pip, an Aussie in her 60′s who is on the road for six months. She had already crossed China and Mongolia, and my first foray into the city of Tashkent was to help her get her month-long Iranian visa. We both love textiles and for the next two days had a great time in the Bazaar and on a visit to the Museum of Applied Arts. 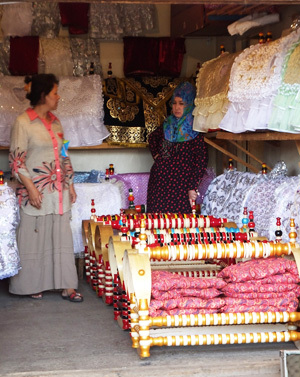 Both places gave us a hands-on chance to see amazing silk and cotton fabrics, both new and antique. We also learned to get around on Tashkent’s phenomenal Metro, an underground subway decorated with beautiful tile and definitely the way to get around. The Metro is both easy and cheap (it costs less than $1 USD to go anywhere in the city). On August 30, I transferred to Hotel Uzbekistan, a huge and quite comfortable hotel (pictured below) in the center of the newer part of Tashkent (Gulnara was in the “old city”). In the afternoon, I took a bus tour of Tashkent. This weekend was a holiday for Uzbekistan Independence Day and everyone was in their sparkly Sunday best. August 31 found me off to the airport for a two hour flight on an Ilyushin twin propeller plane to Urgench. Tashkent is on a major river with large irrigated farms for quite a distance around. Here they farm cotton, watermelon and corn. The fields are all lined with poplar trees (for building houses) and mulberry trees (to feed the silkworms). There is also the “Red Sand” desert, which goes on and on until one gets close to Urgench and Khiva. I took the bus from the airport to Khiva (about 20 minutes) and we checked into a magnificent old medrassah, now a very comfortable hotel. I have the afternoon free to explore. Khiva is small and easy to see on foot. In fact, I don’t remember seeing a car. It is an open-air museum, in effect, although people DO live there. Khiva was important in Silk Road days. The magnificent 14th century buildings have been allowed to decay during the time Uzbekistan was part of the Soviet Union and during that time, religion, while not prohibited, was definitely discouraged after 1920. Because they were built of adobe and soft low-fired brick, the old mosques, medrassahs , city walls and minarettes were soon in ruins. In the 1970s, Russia sent experts and donated the funds to restore the city, which is now truly spectacular. September 1st was Independence Day and the town was filled with Uzbek families enjoying the old town. All the ladies were in bright colored dresses with much sparkle and sequins, with trousers to match underneath and bright head scarves. On September 2, I was on the bus right after breakfast. The little children everywhere were off to school, dressed in their uniforms. The littlest girls often had two big pom-poms of white ribbons in their hair. Everyone was so friendly and almost everyone wanted to practice their English with me. “Hello!” “Where are you from?” “What is your name?” …just like the village children in Yucatan. English is spoken widely here, and there is a great emphasis on languages in college. They particularly emphasize English, French, German and Japanese. The drive from Khiva to Bukhara is long and a bit tedious. Once we are out of the irrigated area around the Oxus River, it is desert all the way and a bumpy road almost all the way to Bukhara where we arrived at around 4 PM. 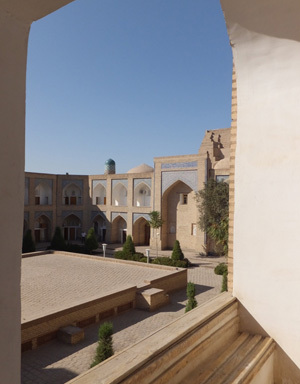 I’m still on this adventure and not home yet… stay tuned for more reports from the road in Uzbekistan! Posted: September 9th, 2014 under Global Travels.